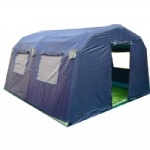 This tent can be used as portable car garage or mobile workstation. It's very convenient to have this workstation to be moveable to different place as for auto hail repair work. Very easy to set up by one person, to use blower, it can be inflate up within mins. And deflation also very simple, cut off the electrical, then the tent can be deflate and wrap up. So it really a poratable workstation, very smart mobile office. The tent color and printing can be customized according to client's request. stitched tent, client can give us specified requriement,then we can make design as per request.